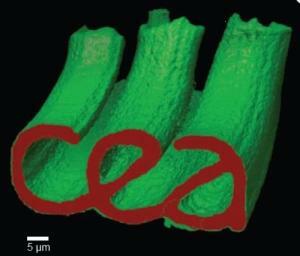 These results demonstrate that the self-assembly process of actin filaments may have unanticipated industrial applications. Computers and smartphone performance improves each year due to the increased density of the microelectronic components they contain. This densification is the result of increasingly advanced miniaturization. It is in the process of reaching a technical limit due to the size of certain components that is close to that of some atoms. The microelectronics industry is thus confronting a physical barrier for increasing the integration density of components that only a technological breakthrough can overcome. One solution may be the integration of microelectronics in three dimensions. Current microelectronic circuits are flat. Stacking components on top of one another is a solution for further densification, improving performance and reducing electric consumption. This poses a new challenge: how to connect the components together once they are stacked. Although manufacture and stacking are based on mature technologies, creating vertical connections to link them together and running a current remains complex. While current 3D microelectronic technologies for these high density connections are effective, alternative methods are worth evaluating.